Bring 1 gal of water to a boil. Wash all the fruit. Cut apricots in half and remove the pits. Pit the cherries. When the water starts to boil, carefully add fruit and bring water back to a boil. Switch heat to medium and let the mixture boil for 30 min uncovered. When time is up, remove from heat and stir in 3/4 cup of sugar or to taste. 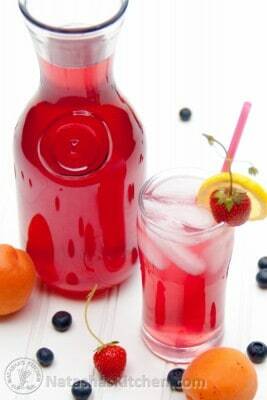 Let kompot cool completely, strain off the juice and refrigerate. Serve chilled.